Tonight on BBC 2 Scotland there is a documentary about William Mcilvanney who, arguably, took Scottish fiction by the scruff of the neck in the 1960s and brought it up to date, into the spotlight and made it relevant to the people of Scotland. Without him, the documentary argues, there would be no Ian Rankin, no Val McDermid. I must confess to not having read much of his fiction but think I ought to do something about that and get properly acquainted with this pivotal figure. I am not sure if viewers outside Scotland will be able to access the broadcast but the attached article gives snippets and additional material so it would make a good place to start to explore. I thought I would share one or two of the responses to our straw poll of best (non-series) Trollope novel over the coming days. Thanks Craig. I think you’re spot on about the dialogue in Lady Anna. Trollope does have an ear for dialogue that makes it sound right when reproduced on the page. Do others agree? Do you have other titles that you want to put forward? A reminder to readers of Victorian fiction (yes there is some besides Trollope! ), there are still a few places left on what promises to be an excellent weekend course comparing and contrasting Trollope (Barchester Towers) with Thackeray (Vanity Fair) and Dickens (Bleak House). The course is taking place at Dillington House, Ilminster, Somerset. I have read (or re-read) all three books in preparation and am looking forward to it enormously. Which is Trollope’s best novel? This question will always provoke a debate whenever two Trollopians get together. Of course it is not always easy to dissociate some of the Barchester or Political (Palliser) novels from the series which contains them. While they are self-contained, they do benefit from their position in a larger canvas. Thus they may benefit from the “halo” effect of the overall series. I’ve been prodded into thinking about this question by a post on the excellent Interesting Literature site which asks the same question about the novels of Thomas Hardy. Now I would actually disagree with their conclusion but not the opening statement that when coming up with a top ten list for an author of a mere fourteen novels (at least one and arguably two of which are juvenilia) it is a simple matter to throw out one or two and the debate comes down to one of the order of the top ten. In Trollope’s case, though, the question is altogether more vexed. We have 48 novels to consider. Perhaps it would make it more interesting to eliminate from consideration the Barchester and Political novels (I am already pained at the exit of Lizzie Eustace) and consider only the standalone novels. After further investigation I have discovered that the Trollope First Day Covers are still available as a presentation set. The limited run of 200 that were franked on the day of issue has been sold out, as we reported last week, but unfranked versions can be purchased either online or in person at the Postal Museum. The presentation pack contains strips of both first and second class stamps, the specially designed commemorative envelope and an insert about Trollope and his work at the post office. 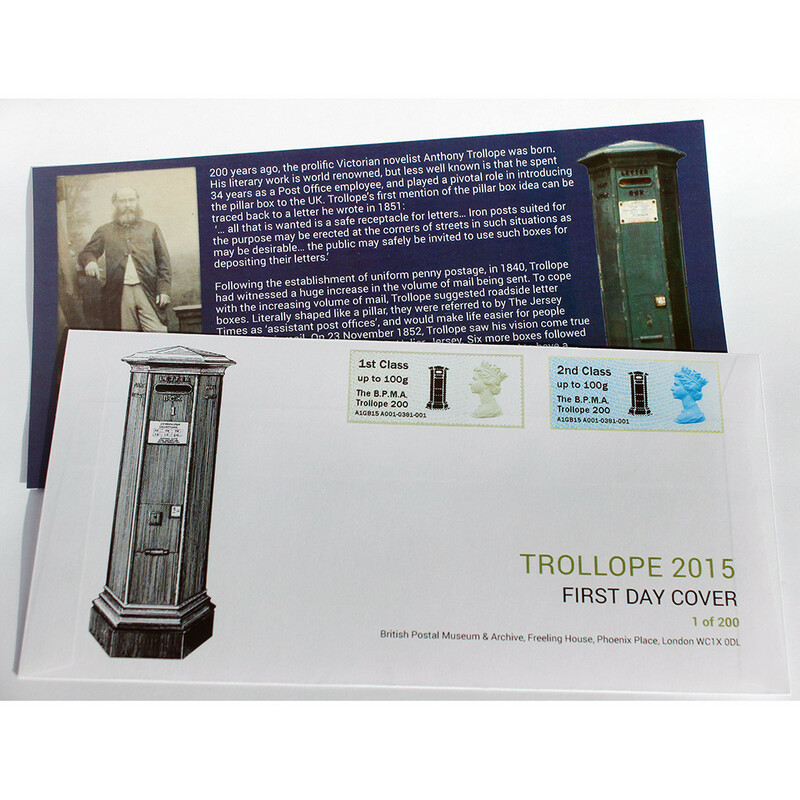 The Post Office has commemorated the bicentenary of one of it’s greatest servants, Anthony Trollope, who introduced the post box in this country, by issuing an exclusive special edition first day cover. Only 200 were produced making them extremely collectible. I am indebted to Helen Baker for a fantastic piece of Trollope spotting! To think I used to live within a couple of miles of there and never knew.